This issue covers the week from 09 of November to 16 of November. I wasn’t sure if the DEF CON Recon village talks were going to be made public. Boy, was I happy to see them shared on Youtube! All the talks are interesting since they focus on recon in a very practical way. When XSS payload is injected inside a hidden input field, it can be hard to exploit. Until now, one way to do it was using expression() but it worked only on IE<=9. The payload is executed once the victim presses the key combination ALT+SHIFT+X (on Windows & Linux) or CTRL+ALT+X (on Mac OS X). This is a very impressive script. It allows you to bypass all SSL certificate checks on any Android app, including SSL pinning. Playing with Android apps’ source code and different SSL pinning bypass techniques can be fun and educational. But sometimes, we’re on a hurry and just want to get rid of SSL pining to start looking for bugs. It’s never been this easy! All you have to do is install Frida, download the script and run it on the app’s package name. It’s almost instantaneous and you don’t have to meddle with the app’s code, re-patch it, etc. This is a great tip for finding less obvious blind XSS vulnerabilities: Don’t limit yourself to testing forms. Find contact email addresses (by scraping your target site or guessing), and send your payload to them (in subject & body). Sometimes the forms are well sanitized but the email messages are not and they’re added to the same admin portals. 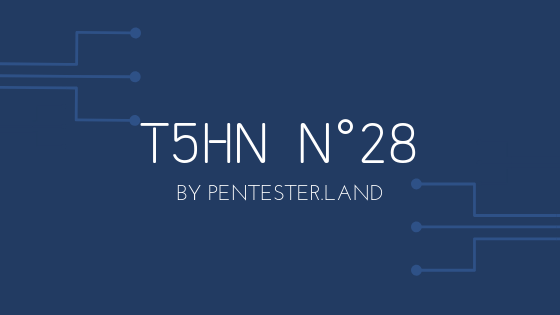 This is a great account of what went wrong during a pentest… for the pentester, because the target was doing their job well! I don’t want to spoil it. I’ll just say that it reminds me of the Stealing the network books. It’s both a (little bit) technical & a very entertaining read. OWASP DevSlop site, OWASP DevSlop project & OWASP DevSlop Show: New OWASP project, site & Youtube channel. A collection of DevOps-driven applications, specifically designed to showcase security catastrophes and vulnerabilities for use in security testing, software testing, learning and teaching for both developers and security professionals.